Gerardo Parra's prior immature histrionics notwithstanding, home plate umpire Bill Welke's tossing of Dodgers starter Clayton Kershaw, after nicking Parra on the elbow with an inside pitch (that was not up in the zone), was nothing but the weakest of sauce. Kershaw, furious, was tossed. Don Mattingly was also tossed. All 724 people in attendance were tossed. Heck, the post-game spread caesar salad was even tossed. Kershaw was in line for his 19th win of the year having left the game with a 2-0 lead (5.0 IP, 1 H, 0 R, 0 BB, 5 Ks (which unlocked his mlb.com badge of 7 Ks, inexplicably))--but only if the Dodgers could maintain the lead. The Snakes got one in the eighth to make it 2-1, and then Aaron Miles got a one-out RBI single in the bottom of the eighth to put the lead back at two runs. Kenley Jansen allowed a leadoff single to come around to score with two out, but got the victory by striking out the side, ending the game with a called strike three on Chris Young. Kershaw earns the win, and the Dodgers salvage the last game of the series. Matt Kemp got his 39th SB and went 1-for-3 with an RBI. Eugenio Velez remains hitless on the season, but has not yet sucked enough to make the recently-published list of the worst full-time players of the last 50 years (in fact, no Dodger was on the top 20). Adam Kennedy just snuck in as badge #370. Well, it was intentional, if Matt's lousy poker face in his post-game interview is to be believed. Ever since Dusty mentioned it, I can't help but notice that Lyons always wears ties in the opponent's colors. Please explain Matty's terrible poker face (I can so believe this) incident? Us mlb.tv-ers don't get any postgame whatsoever. They brought up the HBP, and then mentioned that Kershaw went five innings, which caused Matt to bust into a huge grin. Hmm. Given the dilemma (wanting Kershaw to last five, but also wanting to plunk Parra), couldn't we just have had Barajas throw the ball back to the mound, arcing the ball through Parra's dome? Gotta love the fact that the Dodgers scratched and clawed this victory together after Kershaw had left with such a slim margin. All Monday could talk about on the radio (without telling the score of the game, btw) was that the Diamondbacks had comeback victories all year long. I almost thought Rick Monday might be Mark Grace. Did I hear Mattingly right? Welke told him Kershaw hit Parra in the ribs? Yep, I heard that right. Cory Wade gives up a HR to Luis Gonzales in the bottom of the 12th to give Seattle the victory, 2-1. Oh, and Trayvon went 1-for-2 with a walk and a defensive highlight play. 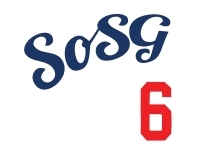 Who Wants to Represent SoSG on the Diamond? Another Dream Team in Florida? Welcome to the Wild Card, Rays! SoSG EXCLUSIVE: FIRST LOOK AT "MONEYBALL"